"We were thrilled to learn that our fieldwork contributed to the CITES suspension of exports." Not much is known about the West African Seahorse off the coast of Senegal and Guinea in West Africa, so it is currently listed as Data Deficient by the IUCN. Seahorses are exploited globally for traditional medicines, aquarium display and curiosities. Such consumption is generally unsustainable, with all seahorse species are listed by the International Union for Conservation of Nature (IUCN) as either Vulnerable to extinction or Data Deficient. Hippocampus algiricus, the only seahorse species found off the coast of West Africa, falls under the latter category, with no known research on its biology, ecology, fisheries, trade, or conservation status. Even its distribution and habitat use is largely undocumented. West Africa only recently began exporting seahorses, as supplies from Southeast Asia started to decline in the late 1990s. The only set of formal data on international trade in seahorses indicates that about 500,000 to one million seahorses were exported annually from Senegal, Guinea and Togo in 2004-2010, all of which have relatively short coastlines. The data set suggests that most exports end up in Hong Kong SAR, mainland China and Taiwan. West Africa’s growing role in the global seahorse trade means that we must understand that region’s trade better to anticipate shifts in supply, and hence demand. Project Seahorse, global experts on seahorse conservation, will undertake short-term research in West Africa in order to expand our knowledge of this seahorse species and its exploitation. Project Seahorse has a long and accomplished history of ecological and trade study: as well as being responsible for most field and trade research on seahorses, the organization has generated most of the conservation action and trade controls for these fishes. This project will form the basis for in-country joint initiatives for seahorse conservation. Under the Convention on International Trade in Endangered Species (CITES), a total of 175 nations have agreed that seahorse exports need to be limited to sustainable levels if wild populations of these fishes are to persist. A great deal of information is needed for such controls to be implemented in a meaningful way. Such support is particularly important as seahorses are among the first marine fishes of commercial value to be brought under these international controls. 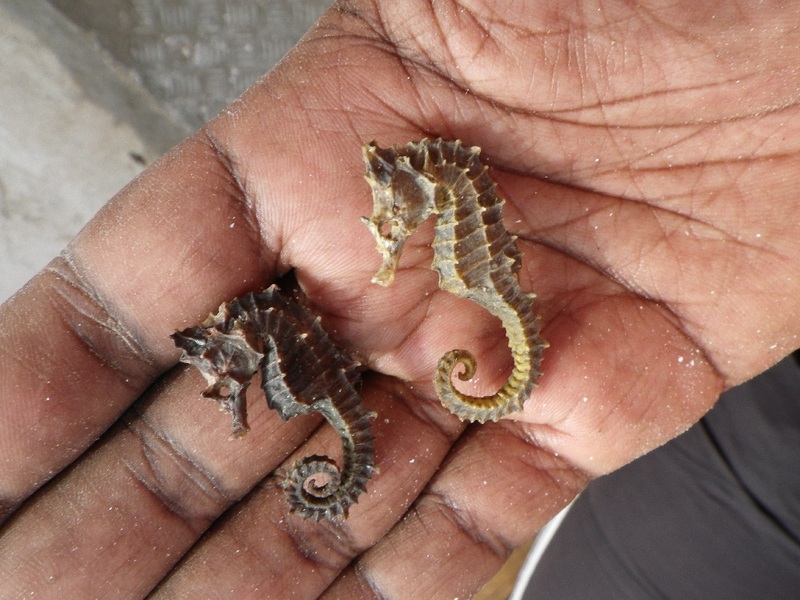 By determining the approximate levels of seahorse trade in West Africa, Project Seahorse will gauge its potential impact on local populations and global trade dynamics. The project findings will be disseminated in reports to governments and other collaborators to improve export management, and will also be published as a primary/refereed publication. In April, the Convention on International Trade in Endangered Species (also known as CITES, the UN body tasked with ensuring sustainability in the global wildlife trade) announced the suspension of all exports of the threatened West African seahorses (Hippocampus algiricus) from Senegal and Guinea — thanks in part to our fieldwork supported by People’s Trust for Endangered Species and the Mohammad Bin Zayed Species Conservation Fund. Seahorses are listed under Appendix II of CITES (Convention on the International Trade in Endangered Species); they can be legally fished, but a permit is required to export them to other countries. In 2012, CITES became worried about whether exports of the West African Seahorse were indeed unsustainable, prompting an urgent need for field research on this unstudied species and its fisheries and trade. You can read the project final report here.